The product you chose is discontinued, but we found something similar you might like. Your Hotpoint 30 in. 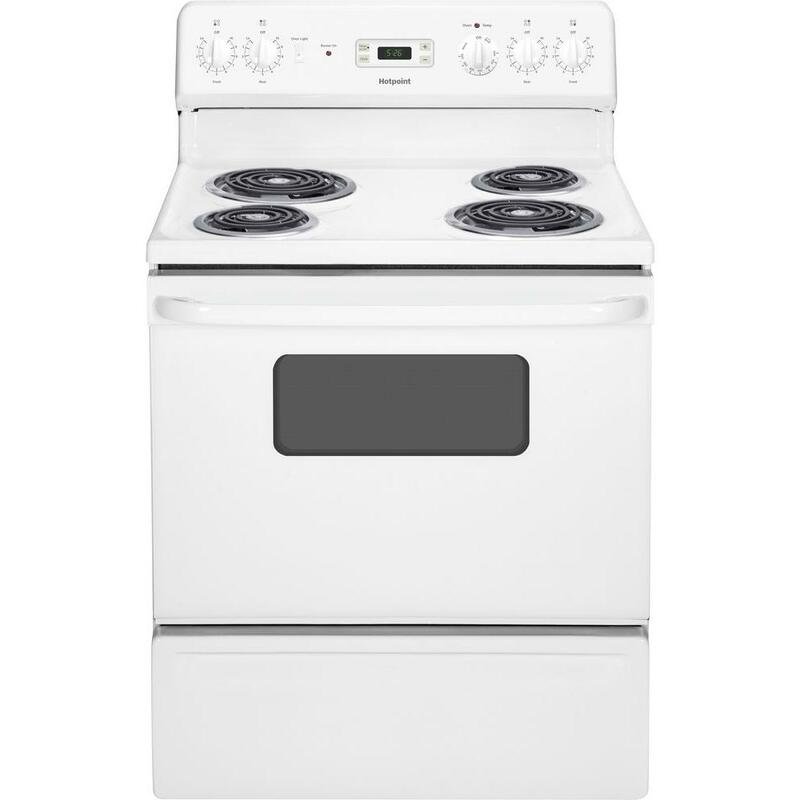 Freestanding Electric Range in White features a super-large 5.0 cu. ft. oven capacity that provides an impressively large interior for cooking more dishes and large meals at one time. Four powerful coil heating elements provide consistent and even heat on the sleek porcelain-enamel cooktop, helping you cook a wide variety of your family's favorites. The range's white, frameless door and designer-style handle create a stylish look for any kitchen. What cord with plug does it take? It comes with the cord, but you are charged extra for it. It runs on 220.
does it have a oven light? Not when they delivered mine, as I did not expect to have to buy a power cord for a major appliance. They basically had to leave it in the garage because they could not install it. I am an electrician, so I did it myself. Does this model have a white exterior? Hotpoint 30 in. 5.0 cu. ft. Electric Range in White is rated 4.3 out of 5 by 144. Rated 4 out of 5 by Kat from No regrets I really do love my new range. I did not want something with a lot of fancy features, just a basic stove and oven that looks good, and this does. One or more of the reviews complained about the bottom drawer, so I was a little worried about that, but mine works like a dream, and it is roomier than my last old Hotpoint range. I think one person said you couldn't open it while you were cooking. I am wondering if he meant the stove might start tipping when you open the drawer. The installers placed brackets on the wall and fastened the range to keep it from tipping (earthquake proof), so maybe this person did not have the range installed correctly. I had a little problem with the oven temperature, but I learned how to calibrate it, and after a little frustration and time, I did get the temperature right; however, the oven knob was very hard to pull off at first, and I may have broken it, because now it fits very loosely and does not feel like it is on snug, which bugs me. I have ordered another oven knob. I can still use it, I just don't like it being so loose. Rated 5 out of 5 by Mary213 from Great range! I had to replace my stove and was particular in what I wanted. I didn't want a smoothtop because I don't find them to be as durable as exposed coils. When I cook I don't always want to have to be very careful as not to scratch the smoothtop. Also, you can't use cast iron on them. I was picky because I wanted a coil burner with a turn-knob to control the oven, not a digital setting. I was happily surprised to find this stove. I couldn't believe the value - I expected it to cost a lot more. Since Home Depot did not have an in-store display I went by features and photos. This stove is efficient and the coils heat up immediately. I'm very happy with this purchase. Rated 5 out of 5 by DLNewOven from Great Product for the Price Replaced my broken oven (had to use a counter top oven for a year) with this model. I was thrilled to be able to cook in an oven that was full sized instead of my counter one. This oven may not be the highest tech version, but I prefer the ease of use with this model. Especially since my previous one had the control panel blown and would have cost more to repair than to replace. This oven has worked very well, cooks evenly and the oven light is bright enough for me to check the food without losing heat by opening the door. My only issue is that I wish it came with three racks instead of two and it needs to have an oven pan issued with it. Good thing I kept my old one. Rated 5 out of 5 by NeedsChocolate from Exactly what I wanted. This range is exactly what I wanted. Simple design and easy to use. My last range had so many bells and whistles that I never used. The only thing digital on this range is the clock and timer. The rest are just simple knobs. The burners also regulate the heat much more evenly then my old ceramic top stove. My only complaint is that the storage drawer doesn't have a better handle for opening. I have trouble gripping things, so I have to open it by pulling on the sides of the drawer. I am extremely pleased with my purchase. Rated 5 out of 5 by cook from Hot Point Range / Oven No more digital panel to go bad and knock out all of the oven's controls. Just a simple dial thermostat for the oven. Turn on and set. It is that simple. The only thing digital is a clock and timer. I really like it, and the quality is as good as more expensive "name brand" ranges. Thank you Hot Point !!! Rated 5 out of 5 by Fulton from Great Purchase I am tired of going through stoves. All that I have had is digital. I picked this stove due to ALL the knobs are the old fashion turn dials. (even the oven) Features I looked for: Light in oven. Yes. 5.0 is very large for oven. Turkey was done to perfection. Could place 4 casserole pans at one time. Great. The burners are setting at different heat temps. compared to my old one. This one simmers on 7...when my old one was 4 setting. That's okay. Just got to get use to it. The burner pans are Teflon. (I worried that would be aluminum. Nothing fancy. Cooks well. It does have a timer and clock. Great value upon purchasing with the Cyber holiday deals. I used my old cord to hook up the electricity. Rated 4 out of 5 by D349 from Excellent Stove for the price. My only problem with this stove is the storage drawer at the bottom. It comes off the track sometimes, when pushing it back in. Other than that I have no complaint. It is attractive and efficient. Though this model does not feature a self cleaning oven; that is not a major problem for me. I don't bake alot; but when I do I line the bottom with heavy duty foil and if a mess does happen, I'm sure a can of Easy Off will do the job.